The Sarasota Muralist: I'm Back!!!! Hello. Truth be told, I never really went anywhere...I simply neglected my blogging duties for way too long. Part of that was because I kind of 'stepped back' from working strictly on murals and starting doing......well....if you follow along on what will be a very long post, in terms of photos, you see what I've been up to for the last year or so...or at least 'some' of what I've been doing. I'll save some work for upcoming posts. Let's get started. From late 2008 through 2009, I was involved in quite an array of interesting projects. In addition to painting murals, I'm also a graphic designer, (including web sites) and craftsman. The craftsman stuff probably started WAY back when I used to build models of the local race cars back at the Reading Fairgrounds. 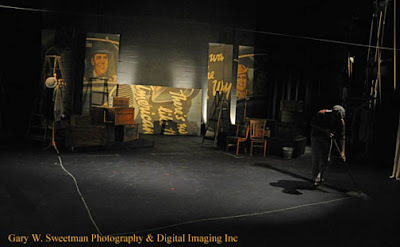 I ended up working on several other projects for the Rep Theater as well as the main stage. 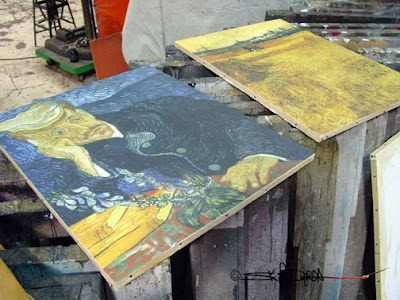 The image below shows a few of the Van Gogh images I printed for the show Inventing Van Gogh. I also did a HUGE project for them for a show called Blur. No pics of that one yet...but it was BIG. Next up was an architectural rendering of sorts. 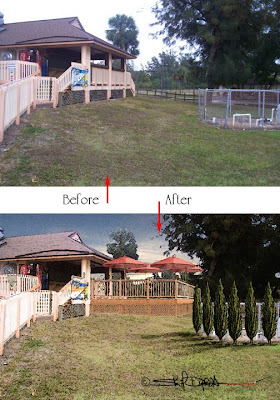 I was commissioned to create renderings of the Siesta Key concessions to show how prospective management would plan on making improvements to the property. The image below shows a before/after view of the South concession, showing the photo as it was taken and then how I 'altered' it to show the improvements. I also did the same for the North concession area. I worked on several 'normal' projects up in the Tampa/St. Pete/Clearwater area with my painting partner Abby Kent. Most of those involved faux finishing which, in my opinion, never photographs well enough to do it justice. So I'm only going to include a few details. 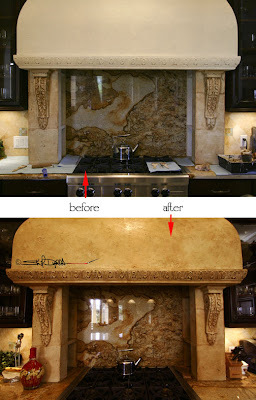 The top image is a range hood I faux finished. All the cement details looked pretty blah until I added some color and interest to them. 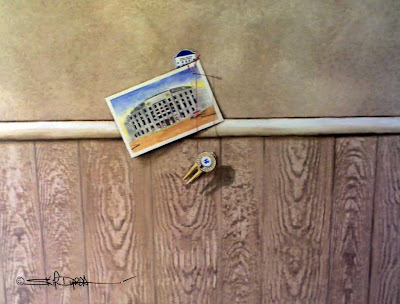 The photo under that is a detail shot of a home office wall I fauxed and wood grained (pickled off white oak) and added a little Trompe L'oeil detail of some Yankees stuff. Bad photo....from my phone. One more 'normal' project to show. This one at an "Adult Fun Center". Sounds funny, eh? Basically, it's a store filled with slot machines where you pay for tokens, feed them to the 'one armed bandit' and hope to win gift certificates. 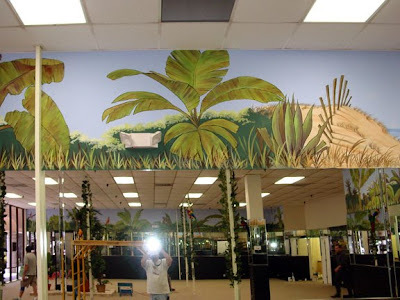 In any case, I painted a jungle scene around the top 4 feet of 3 long walls. The image show but a small portion of what I painted. I'll add more images to my web site when I 'get 'round to it'. Next project was most interesting and probably the most challenging. 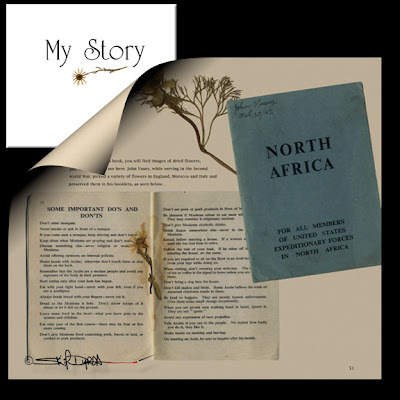 I was commissioned to design a book for a dear friend and client, Rosalie Silver. It was to be her memoirs. She showed up at my studio with her 60 plus page script in hand as well as two large cardboard boxes filled with photos, newspaper clippings and all kinds of paraphernalia she had saved over many years....all to be scanned and photographed. True to form, Rosalie had everything in order, with yellow Post-it notes everywhere. The hard part was taking what she wrote, ably co-authored by Linda Maree, and fitting all the images within all the various sections of the text. It took my almost a year but the results were worth the wait. The image below shows the book cover underneath one page of the book. Each page was created as one full-bleed graphic rather than use standard templates. We used Blurb as the publisher and they did a great job. Ahhh...I almost forgot. I did a second book as well. This one quite different from the book I mentioned above. This second book, actually a 'booklet' was created for another friend and client, Carole Stevens, who was planning on attending the SurTex show in NYC as well as others that deal with art licensing. She asked if I could design for her a pamplet and of course, I said, I could. But that's what everyone has done. So what I suggested is that we create a booklet that shows her work as if it had already been licensed and applied to all kinds of products. The image below is one half of a two page spread. I did this for each of nine images we used, using the base image, blown up and faded, for the background. 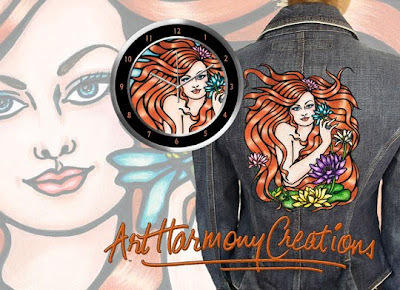 I made her logo for Art Harmony Creations look like it was embroidered and the clock you see was created entirely from scratch in Photoshop (with Carole's help on that one). You can see the entire book here and did I mention that she sings as well? Go here to listen to one song and watch a video I created for her web site. OK...this project was for another client and dear friend. We helped decorate for her son's Bar Mitzvah, which took place (the evening party) at The Sarasota Classic Car Museum, so everything was car related. My part in the whole 'scheme' was to create table seating assignments in the form of a valet parking car-key board. 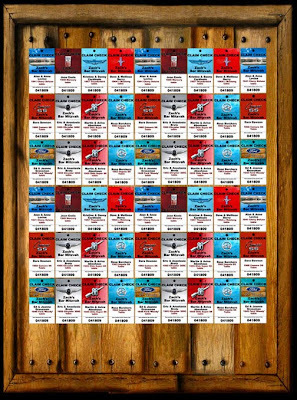 I wish I had taken photos of the finished board....maybe someone has some, but what I did was design sets of 'tickets' for each table as you see in the photo below. 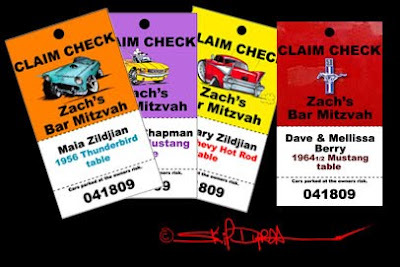 So each table had an assigned car, like the red ticket in the image...their table was the 64 Mustang. I think I designed eleven different 'sets', with each set having individual names on the tickets. About 108 tickets. But then.....I took a photo of my bathroom door in the studio, which I woodgrained. I used that image to create the background for the ticket 'board', The image of that below is a 'mock-up' of the concept. The real version had many more tickets, in 11 different designs, each one hanging from a map pin and having it's own actual car key. The 3 ticket examples to the left of the red ticket were for the 'kids' tables. Thanks, Art. I've checked on your blog as well a few times as well. Really nice stuff...loved the new store mural you did and those columns.